As our podcast wraps up this character-driven season of Luke Cage, Pete and Matt look back over all thirteen episodes... and wonder when season three will be announced! Great review. 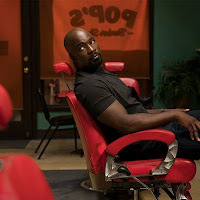 I do mcu reviews on YouTube "Da Good Da Bad Da Reel "
Cloak and Dagger: 109 "Back Breaker"
Cloak and Dagger: 108 "Ghost Stories"
Luke Cage: 213 "They Reminisce Over You"
Luke Cage: 212 "Can't Front On Me"
Luke Cage: 211 "The Creator"
Cloak and Dagger: 107 "Lotus Eaters"
Luke Cage: 210 "The Main Ingredient"
Luke Cage: 209 "For Pete's Sake"
Cloak and Dagger: 106 "Funhouse Mirrors"
Luke Cage: 207 "On and On"
Luke Cage: 206 "The Basement"
Luke Cage: 205 "All Souled Out"